Dol Jatra, also known as Dolotsav or Dol Yatra, is the Holi festival in Bengal, Odisha and eastern parts of India and is of great significance at Shantiniketan in West Bengal. Doljatra 2019 date is March 20. It is celebrated on the Poornima day (full moon day) in the Bengali month of Phalgun. The festival is also known as Vasant Utsav or Basant Utsav as it is observed during the spring season. It is widely believed in eastern India that Lord Krishna expressed his love to Radha on the Dol Jatra day. On the eve of the festival, twigs and wood are collected and burned in remembrance of the legend of Prahlad escaping unhurt from the fire into which he was carried by Demon Holika. The festival is celebrated with colors and the festival begins by paying respect to the dead parents, relatives and ancestors. People put small amount of colored powder (phaag) on the pictures of photos of the dead. Next they take the blessing of elders by offering some color on the feet. Elders bless youngsters by putting some color on the forehead. The subdued celebration of Dol Jatra ends after taking the blessing of elders and then people venture into the streets and throws colors on everyone on the street. All people, irrespective of age and social status participate in the festival. Songs on the immortal love of Krishna and Radha are sung on the occasion. Other songs include those on nature’s splendor. The festival Dolyatra is of great importance at the Shantiniketan in West Bengal. It is a major event here and the preparation for the celebration start in advance. The festival here is referred as Basanta Utsav and was initiated by Rabindranath Tagore. Rural Orissa puts on a festive look in the months of February and March, when the festivals of Dola Jatra and Holi are celebrated. The two festivals compliment each other and the preparations for the festivities begin on the full moon day in February (Magh Purnima). On the full moon day, villagers create bonfire like in Holi festival. The bonfire symbolizes the burning of ‘Agira’ who is responsible for various diseases. Vegetables, grain and coconut are burned in the fire. The burnt coconut and vegetables are distributed as ‘prasad’ and the ash is sprinkled on the agricultural fields. A few days before Dola Purnima (the full moon day in March), the local deities visit houses in the villages and are offered sweets made from the recent harvest and fruits. A procession consisting of village elders, young men and children accompany the deities. 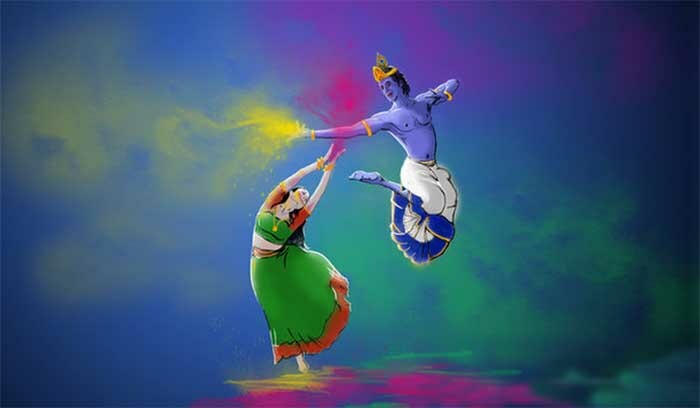 The deity distributes different powdered colors for the ensuing Holi. The celebration continues and on the fourth or ninth day after the Holi celebration, the deities are taken into the main street. The procession and the fair are known as Panchu Dola or Dasa Dola. Various rural art forms, people dressed as gods and goddesses, marital arts, and various other entertainments form part of the fair and procession. Special arrangements are made to house the deities from various temples during the fair. On the final day, the deities return to the temple and natural colors are sprayed on the deities. The entire routes through which the deities move are smeared with natural colors. People believe that these natural colors have medicinal properties. In reality, the entire fair and procession are part of harvest festival and is a celebration of the onset of Spring season. People have time and money as the harvest season has just concluded. First the dried leaves and twigs are burnt. Then sweets and dishes are prepared out of the newly harvest. On a closer look, most Hindu festivals are a thanksgiving to nature.